My mother used to always tell us the story of our birth on our birthdays. She would call or I would see her and she would start off with “Twenty-one years (or whatever our age was) ago today, I had a baby girl.” Then she would tell us the details of that day. And we laughed…but, we always waited for the story. I’ve done the same with my kids. It’s just a funny tribute to my mother and a sweet remembrance of those special days when I gave birth to my incredible children. 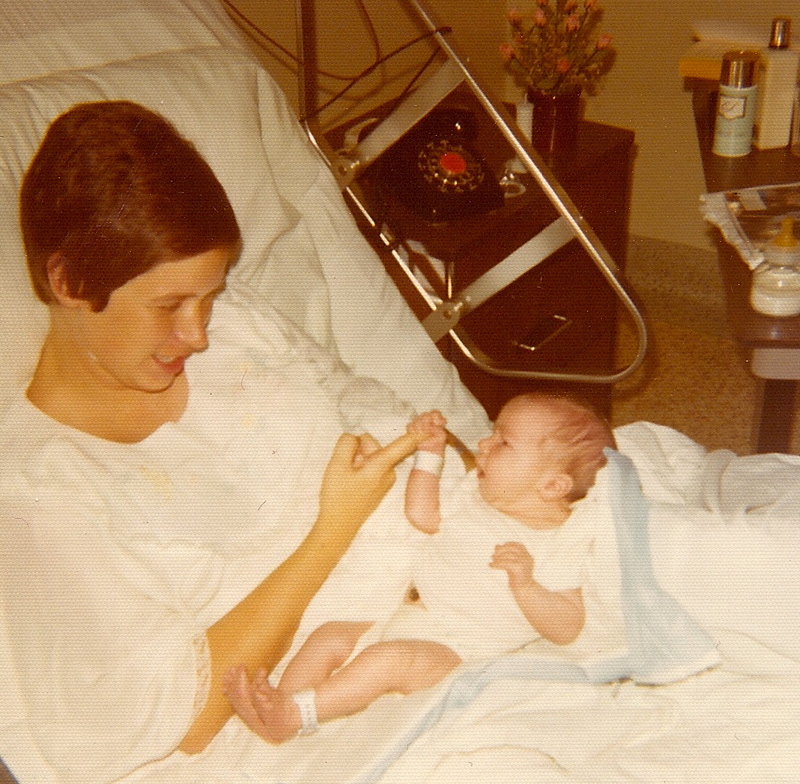 Thirty-seven years ago today, I had a beautiful baby boy. He was my fourth child, following three girls. He wasn’t planned, which turned out to be appropriate. Who could have planned for Clayton? That day, I felt like I was having labor pains, so I called the doctor and he had me go to the hospital. I had the girls very quickly and he knew that I didn’t need to wait around. The girls were all born early and this one was late by about a week. Of course, we didn’t know he was a boy. This had been an interesting pregnancy anyway. I didn’t know I was pregnant and they did some tests and decided it was an etopic pregnancy. I had surgery and they cut me open to find out that everything was ok. I must have had an MRI and they had just gotten the machine and nobody was very proficient in reading the tests. I remember the doctor opening me up and then cursing. He realized I was awake and apologized, but I understood that he was frustrated that he had just done surgery on someone who didn’t need it. From then on, the pregnancy was easy. I remember diving in the pool all summer, feeling great. I also remember being at the mall where there was a fountain. I was very pregnant with three little girls with me and one of them tried to climb in the fountain. The thought went through my mind that I must look like a mother duck waddling along with little ones trailing behind me. Another friend told me I just looked like a knocked-up 14 year old. Anyway, on that day, I went to the hospital and waited. The doctor wouldn’t let me go home because of the other quick births. Finally, they sent me out to the fathers’ waiting room to sit with my husband. You can’t imagine how strange that was. Dads didn’t get to go in while you were in labor or giving birth back then…nobody did. The fathers’ waiting room was full of about to be Daddys who couldn’t figure out why I was there. I read magazines with them and read the comments book that the fathers wrote in while they waited. Alan was frustrated and nervous. This was too odd. When I went back into the labor rooms, they tried to check the baby’s heartbeat. The nurse said they were having a problem because the baby was dancing around in there…”doing the hustle.” Well, it was 1975…what an inkling of things to come. At some point during the evening, after we had been there all day, the doctor came in to tell me that the baby was stuck and they needed to do a c-section. I guess the head was pressing on my pelvic bone and couldn’t get over to the way out. He had a dent in his head for a long time that made me laugh. Tears rolled down my cheek, not from fear, but because I could just see another scar on my stomach next to the one from the earlier surgery that had stretched to about an inch or more wide as my abdomen expanded. It turned out that they took that one out & made another one. When they wheeled me into the operating room, it was later that night. They painted my hugely expanded abdomen with iodine so it was oddly orange. They put a curtain across me so I wouldn’t be able to see the operation, but I turned my head and saw the reflection in the window just as they began to cut. I turned back and listened to the conversation. The anesthesiologist was holding my hand & sitting by my head…his name was Dr. Love. When they pulled out Clayton, Dr. McShane almost shouted “it’s a boy!” Dr. Love kissed me on the forehead. Dr. McShane couldn’t wait to get out of there and run to tell Alan. They all knew I had three girls by this point. I just laid there and smiled. Unbelievable! We named him Clayton Alan Fraser. Clayton was for all the men in my family (my grandfather, father and brother) who were named James Clay. My grandfather went by Clayton. Alan was after my husband, Alan, and his father, who was Ralph Allan. We covered all the bases. Alan went immediately to buy him a pair of jeans and found a size one. They didn’t have baby jeans back then. That is the story. Clay was unique in all good ways. He spent the next 35 years teaching me, teaching us all, to enjoy life. He was the cutest, sweetest, kindest little active boy who was determined to be different from his sisters. He didn’t need to try, but try he did to the point of trying us all. Keeping up with him as a job for everyone. He was always a character, always funny. From as early as possible, he and his father would sit and trade puns. He knew he was funny and it kept him out of the trouble he should have been in. He was smart enough to know that he would learn the way he was going to learn and the teachers had just better figure that out. He hated timed tests, preferring to work on his time. He wiggled and squirmed through classrooms all the way through college but probably remembered more than I did being the perfect student. He charmed his way past many a teacher. The typical summary of a kid like this is that his sisters and I were driving to Westminster College for his graduation and got a call from him saying that he was going to go through the ceremony but wouldn’t get the degree. I think he flunked bowling or something ridiculous. We watched him walk in his cap and gown, taking another Clayton moment in stride. He finally got that degree years later, taking two classes and getting As so that he could get into culinary school. He promptly handed me the diploma as it meant little to him. You have to shake your head and roll your eyes. This is a long blog and my heart is full of memories today, so I’ll give the shortened version. Clay grieved when his father died of cancer. He went into a state of depression that we didn’t realize since he was away at college. He came home, fell in love and the wonderful girl was killed in a tragic fire. He picked himself up and went back to school, started a comedy improv group, and began living again. He then went through the graduation I mentioned before, came home and started teaching English as a second language and waiting tables with his friends at BBD. He complained of problems and pains in his jaw and nothing could be found. One day he announced to me that he wanted to have his tonsils out. I told him I didn’t know if you could just ask to do that, but he did. When the doctor came out after that simple surgery, he told me they had found cancer behind the tonsil. I had to wait the weekend to let the doctor explain it to Clay in his office. A horrible weekend that makes me cry to remember…watching him and knowing I couldn’t tell him because I didn’t know enough myself. When we left the office, a tear ran down his cheek. “Why do we always have to get the rare cancers?” Clay had Adenoid Cystic Carcinoma and his dad had died of cancer of the esophagus (rare at the time). A friend told me it was the scream he couldn’t get out. A doctor nodded when I told him that. From the time he found out he had cancer, Clay was adamant with me that this was his cancer. He would be the one to fight it. We all know it takes everyone you have to fight cancer, but he was trying to make me not worry. I look at a statue he gave me one Mother’s Day. It’s of a buddha like figure, bent over with worry. He told me it was to keep me from worrying. That was even before the cancer. The treatment – neutron and electron radiation – that Clay received in Seattle was new in 2001. It gave him 10 more years and it killed him in the end. The cancer did come back, as it does in this kind, and he was able to beat it with natural means. His death was from the residual effects of the radiation. But those last ten years were incredible. As the radiation effects took hold, he lost his ability to talk and eat. But along that journey, he met and fell in love with Whitney, finished school, went to culinary school and became an incredible baker (it didn’t take much talking), and produced Eliza May Fraser. Many people don’t do all that with well bodies. I look back on the 35 years we had with my incredible son and think of all that he gave us. He lived his life on his terms, he loved and was loved by so many people, he made us laugh and he taught us bravery. He lived with incredible pain and touched lives everywhere he went. He had a full life in 35 years and taught me that we never know how much time we have on this earth. This weekend, I was with his daughter Eliza, who is now 3. She knew we were getting together later to celebrate her daddy. We went to the park and she started calling out to him…”where are you, Daddy? Daddy, where are you?” She does this with a smile on her face as she seems to talk to him often. She wanted him to be at the party. It doesn’t make me sad because she seems to have a relationship with him that we all wish we were innocent enough to have. I told her he was there…he is all around us. She understands and that is the blessing. I love you, Clayton Alan Fraser! Karen, all I can say is “well done”. This is a tribute to you, Clayton and all your family. I’m so glad Michael (Woody) met your Wendy. Thank you again for sharing your wonderful family. You are an amazing woman so it would simply stand to reason that Clayton was such an exceptional man. I can’t even begin to wrap my heart around the pain of such a loss. Thank you for sharing your thoughts and feelings. Gives us all another reason to be thankful.